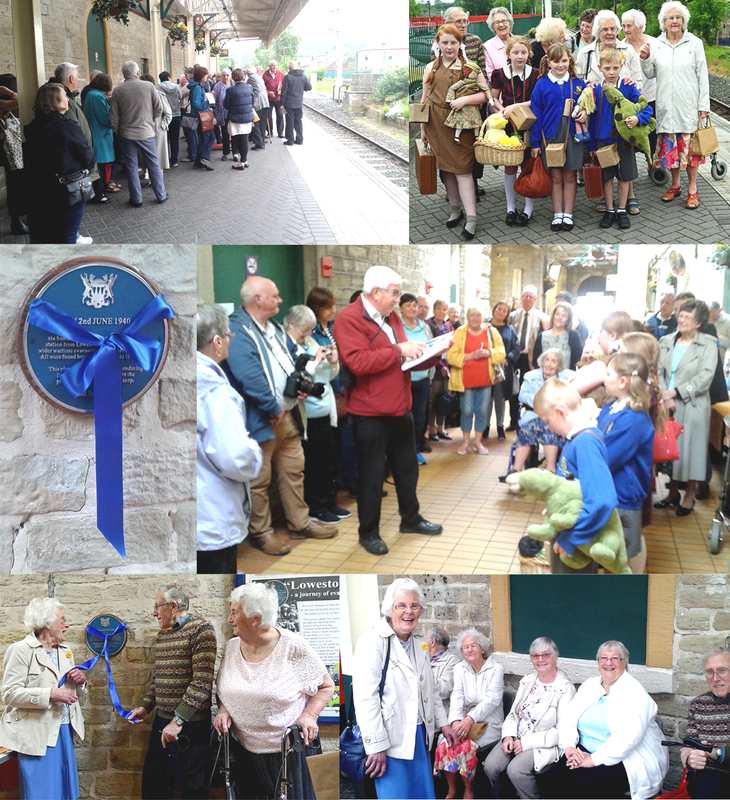 SEVENTY SEVEN years to the day the Friends of Glossop Station and guests welcomed former child evacuees from Lowestoft and those living in Glossop to a celebration marking their arrival in the town all those years ago. 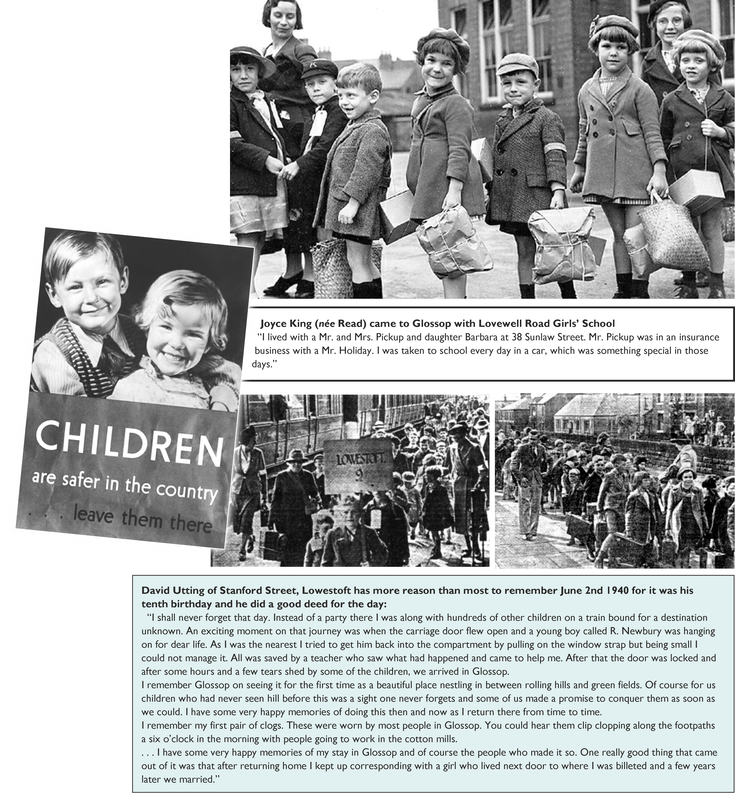 On June 2nd 1940 600 child evacuees from Lowestoft arrived with 30 teachers as part of a wider war time evacuation from East Coast towns. 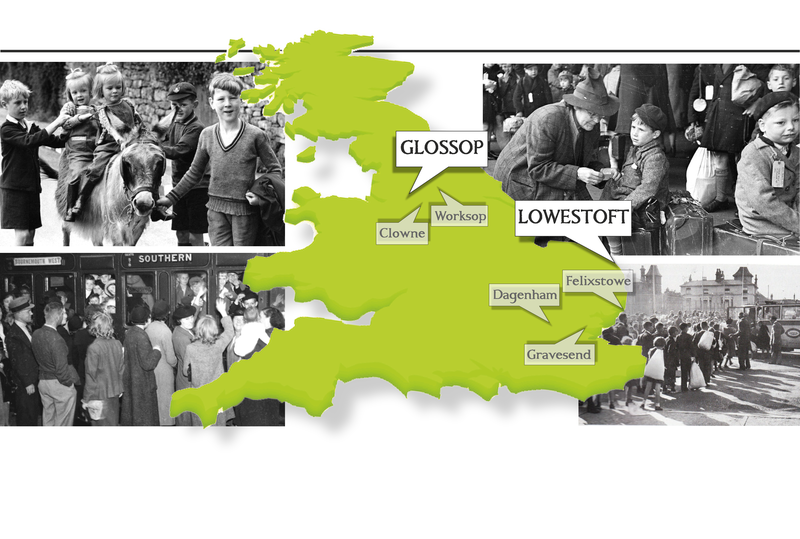 All the children were found homes in Glossop and district. A remarkable achievement! 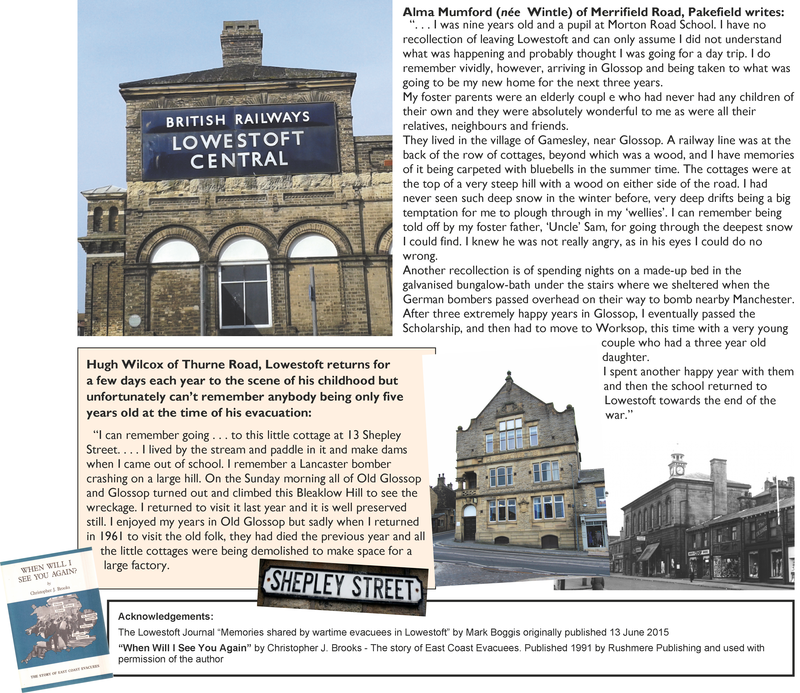 Life long friendships developed between many children and their foster families and for many evacuees the time spent in Glossop shaped the course of their future lives. 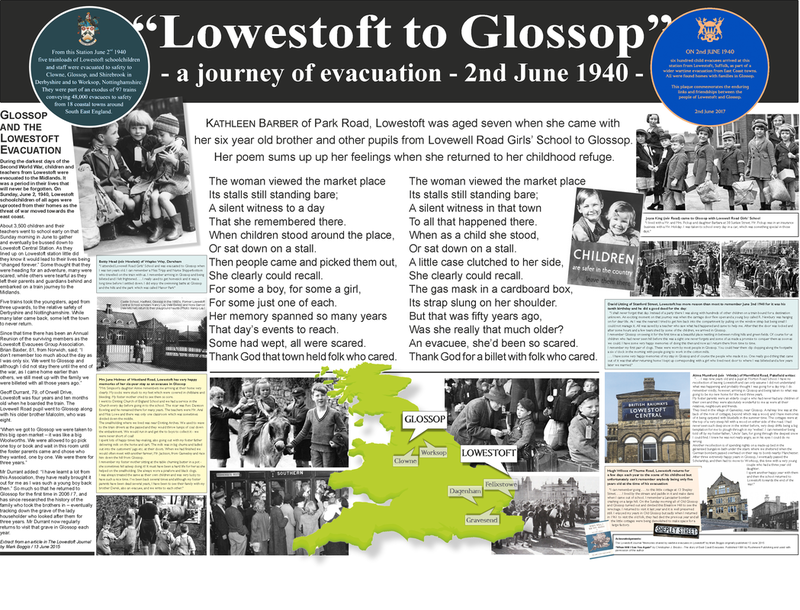 On discovering that, through the work of the Lowestoft Evacuation Committee, the evacuees make an annual trip to Glossop FOGS decided to create a plaque for the station as a focal point for this significant event in the town's history and to host an event celebrating this. On 2nd June 2017 over 80 people attended as Glossop remembered the evacuation to the town of 600 children from Lowestoft. Neil Williams welcomed guests and at 10.05 four children dressed as evacuees arrived by train. A poignant moment as photos were taken with former evacuees. The attractive plaque provided by Simon Denvers was then unveiled and the new Poetry Platform display (see the full image below) created by Paul Marsh about the evacuation caught everyone's attention. 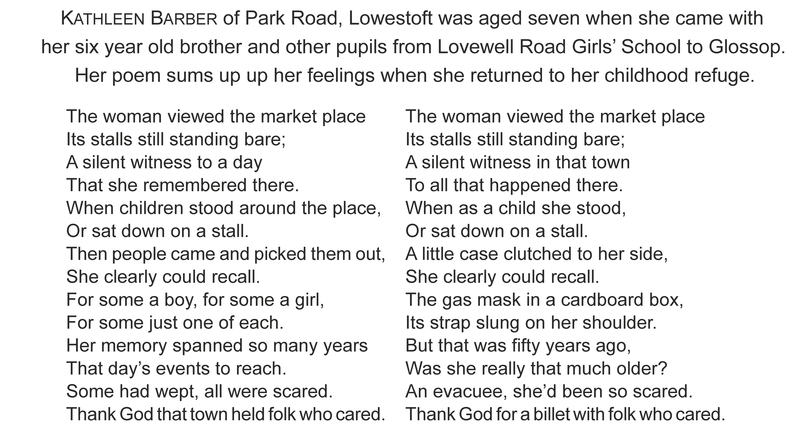 Rita Walpole,from Lowestoft, then read aloud Kathleen Barber's very moving poem about her recollections as an evacuee. Chris Brooks, Lowestoft Evacuation secretary also read a poem and he spoke and thanked everyone in Glossop for past and continuing kindnesses. Hospitality was courtesy of TWIG cafe and Bunty and Jacqueline's home made biscuits! We also welcomed as guests Simon Brooks our Northern Line Manager and Vicky Cropper Community and Sustainability Manager for Northern central region. Neil thanked them for their support and the trust shown to FOGS. Also very welcome were Councillors Jean and George Wharmby and Damien Greenhalgh. We appreciate their ongoing support. Also joining us PC Julian Gallagher Derbyshire Police. Julian maintains a keen interest in the station. we also thank Mike Brown and Anthony Wright from Glossop Heritage Trust for attending and for their help with research and photos. It was a pleasure to also welcome back Dawn Wolrich from ACoRP and renowned railway photographer Paul Bigland. Lastly our thanks for media interest and support: To David Jones from Glossop Chronicle, Diane from High Peak Review and Lissa from High Peak Radio. All have helped to bring people to today's event. The event was hugely enjoyable and we hope we have helped to maintain the already strong friendships between the people of Lowestoft and Glossop! In conclusion our special thanks to Chris Brooks for bringing the Lowestoft evacuees to Glossop especially as they have an event at home tomorrow! And for all his help and historical research. PRAISE FROM NORTHERN . . .
I’d just like to congratulate you on a wonderful event at Glossop this morning. It ran very smoothly and you had an amazing turnout, you should be pleased with what you achieved. As we discussed at the station, it’s events like today’s that really touch people and it’s no wonder I saw many people in the audience with tears in their eyes. I look forward to seeing you again soon. Congratulations once again.